She sat still much better this month. She's got this modeling gig down! I've heard a lot of moms say that each age is their new favorite. I'm really liking the toddler stage. Minus the biting. Ugh... the biting has got to stop! I'm going to do this month's update a little differently. I'm going to give you titled bullet points. You're welcome. Dressing: Bimmer mostly wears 12 month clothes, unless it's Osh Kosh, and then it's 18 months. She's still in a size 4 diaper. She wears a size 4 1/2 shoe... which are nearly impossible to find unless you pay $40 at Stride Rite. Awesomeness. Talking: Bimmer can say mama, dada, papaw, baba (for bottle), ball, bye bye, bubble, book (although it comes out as "buh") and dog (although it comes out more like "duh"). She knows what it means when you ask for a kiss or a hug. She will also give a big hug if you tell her to "give love." She knows what "clean up" means too. She is at a very excitable age, where everything is so cool. She points and squeals and jabbers at just about everything. Sometimes she'll repeat a word to you, but then forget it later. I've heard her say everything from hippo to diaper to bear, but it's not constant. She did just start seeing dogs (in real life, in books, and on tv) and getting excited and saying "dog." So neat to see her pick up on things like that! Eating: Bimmer is getting so much better in the eating department. Her latest faves are peanut butter, sunbutter (only because I can't send peanut butter to school), grapes, hot dogs, mac & cheese and shrimp. She does NOT like chicken nuggets, tomatoes, cucumbers, or feta cheese. My OCD hasn't allowed me to let her try to eat anything herself with a spoon. I've been waiting for a pretty afternoon so I can let her do it in her highchair, in just a diaper, outside in the yard. Playing: Bimmer still loves her purse, bucket of monkeys and picnic basket. She's been "reading" a lot lately. She'll sit and open a book and study the page very intently. She has a big stuffed giraffe my parents got her that she'll tote around with her. She really (like, REALLY) loves her Cozy Coupe. And this toy pirate ship that shoots balls out of a cannon. And a microphone that makes you sound like a hamster. That's a joy. She also loves to play with pillows and blankets. She has also been carrying around a case that holds a large coin that my parents sent her from Alaska. And she has the start of her own magnet collection on the fridge. Basically anything that she doesn't think she should be allowed to play with thrills her. Today? We gave her a ball of aluminum foil and you would have thought it was a diamond ring she was so excited! Singing: Bimmer has always loved to dance and sing. You can tell that school is teaching her some new songs. She knows as soon as you start to sing "If you're happy and you know it" that she either needs to clap her hands or stomp her feet. And when you sing "Wheels on the Bus" she makes a motion with her hands, which must be the windshield wipers. Her class participates in the Christmas pageant, so I will be anxious to see what she learns between now and then! Development: Bimmer is a step away from being able to run. She definitely tries her hardest. She has also started to want to climb. She has been able to do steps for awhile (although The Bungalow doesn't have any steps, so she doesn't get much practice) but lately she's been wanting to throw her leg up over the side of the bathtub, or tries to pull herself up on to the couch or ottoman. She waves all the time, to everyone. Since she likes to pick up things (anything, all the time, even if she shouldn't) she is definitely getting stronger and is able to pick up fairly heavy and awkward items. Not sure how many teeth she had at my last posting, but she's up to 12. She's still weird about chewing certain things, but is getting the hang of it. However, with those teeth, she surely knows how to bite. Last week, she bit 8 different times at school. We even had to have a parent/teacher meeting to discuss it! Ouch! She can also identify some new stuff too... she can point to her head, nose, teeth, and belly. She knows that shoes go on your feet. When she wants a bottle, she now runs to the refrigerator. And she knows that "outside" means to go to the back door! All in all, Bimmer is such a joy. She calls us by name, gives such good love, and is wildly animated. She is anything and everything I ever wanted and more. Gosh, she keeps us busy! Wow! 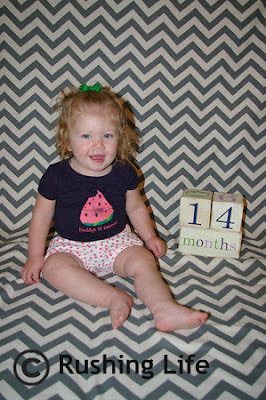 14 months already!??! Eli will be a year on Sunday and I'm not taking it well! It's been so fun to watch Bimmer grow up on these updates you do! Thanks for sharing her with us!